The ultimate goal is to optimize on the opportunities that the 21st century leisure and business tourism presents at national, continental and global levels. This, however, requires a new holistic and integrated product development and marketing capacity building approach, hence the need for this kind of Masterclass. Our diverse and comprehensive Masterclass curriculum will be presented by a faculty comprising some of the world’s most experienced leaders and experts in Sustainable Tourism Product Development, Marketing and MICE industry. It will particularly be valuable as there is no such integrated professional development programme being offered in Africa. The Masterclass is aimed at tourism product development professionals, conference organisers, event planners, industry suppliers including hotels, venues and caterers, corporations organising internal or external conferences and events and providing incentive travel as motivational staff programmes. 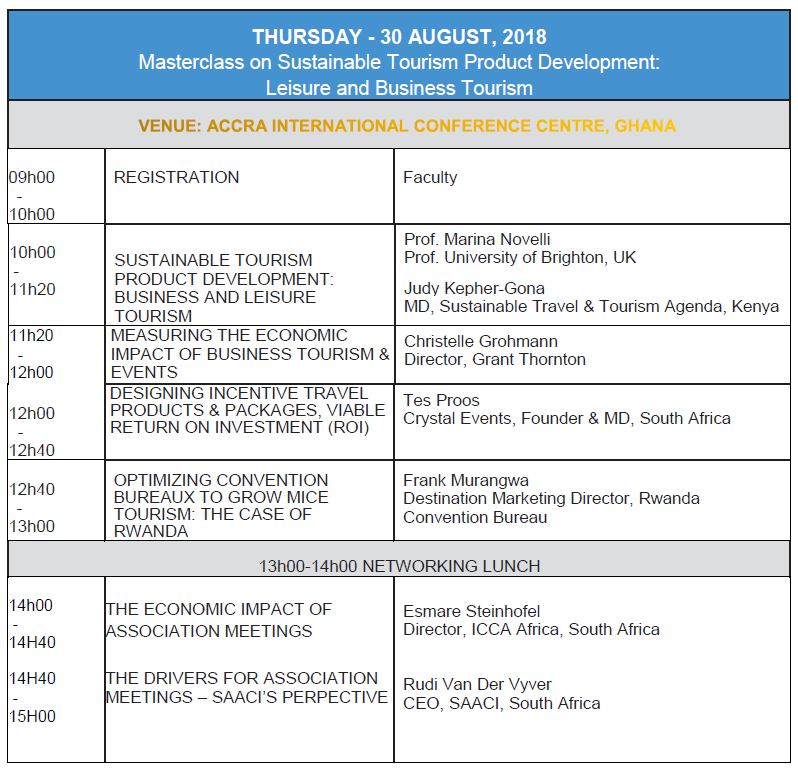 This professional development programme will provide a holistic view of the opportunities for sustainable tourism product development, marketing and Africa MICE (Meetings/Incentives/Conferences/Events) industry. It will focus on among others, on sustainable tourism product and MICE sector issues, trends and key standards, while providing a tangible approach in addressing current and future challenges. It will equip delegates with a clear picture of what Business Tourism and MICE Industry is (and is not) as well as all the essential practical knowledge and skills delegates need to be successful in their new business role. leverage the existing MICE tourism opportunities to bid for mega and hall mark events utilizing existing marketing channels. 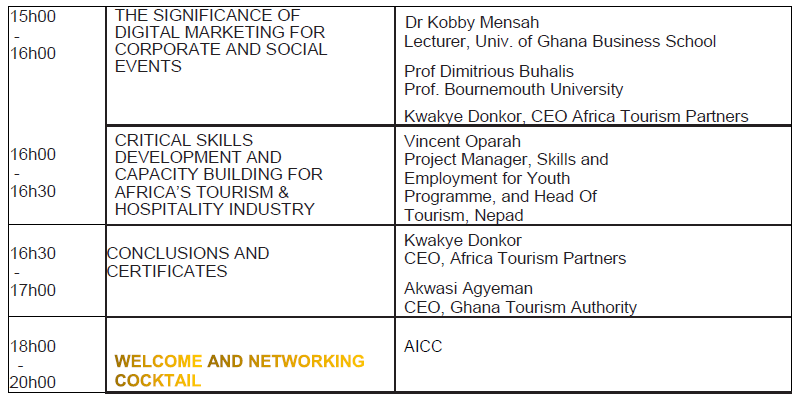 To upskill themselves in sustainable tourism and events product development and marketing. To improve their skills set and competencies of tourism product development professionals, entrepreneurs, events organisers and tourism professionals be more impactful and effective. To ensure adequate knowledge on sustainable tourism product development, MICE sector, components, but in particular how destination partners can work in unison to ensure success. To learn how the public and private sector can work together to develop more tourism products and MICE business to destinations with positive economic impact, and ensure government support.